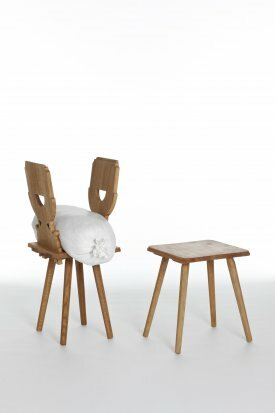 Nic Stubbenhagens Weißwurst Stool is doubtless something other than wholehearted conformity to classic chair design. However, this design poses questions about sitting and, consequently, to the design of seating furniture  for example, whether it might make sense to support the body not only from the back, but from the front, as well. For the body seeking to relax, this would be a significant relief for the simple reason that the front- and back-support hold the body up quite differently than a chair structure that is only secured on one side. For active sitting, that is, sitting and working on something right in front of the body, the person working is rather tangibly relieved of any kind of physical self-control. And this is the real paradox of this model. It may look quite restrictive, but for certain activities meant to be carried out while seated, you actually gain a significant increase in liberty.